A Long and Winding Road, or should I say A Long Winded Post! Last Saturday, October 6, was my birthday. It was a funny but nice day, funny because I wasn't well, but nice because I was spoilt rotten! First of all Mum worked in the shop for me so I could have a little sleep in. Thanks Mum! The Princess and Babes woke me up with a cup of tea, cards and pressies! Babes renewed my Romantic Homes magazine subscription for another year. The Princess bought me pink balloons and champagne shaped bottles of bubbles for us to blow in the air! 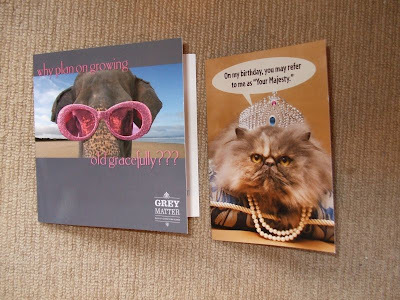 Look at the cards she chose for me, one from her and one from Babes. She so has my number dialled! 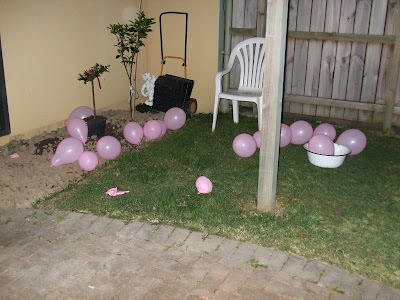 Here are the pink balloons, gorgeous! 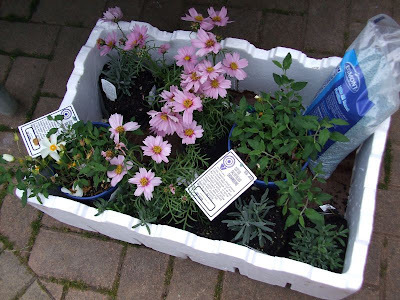 I told Mum I wanted English Lavender plants for my garden and I wanted them done up in cellophane and a bow!! That's exactly what I did get but more!! Sitting on this pink thing (picked up from the side of the road!) are the rest of my goodies. Loads of cards, all pink and girly themed! 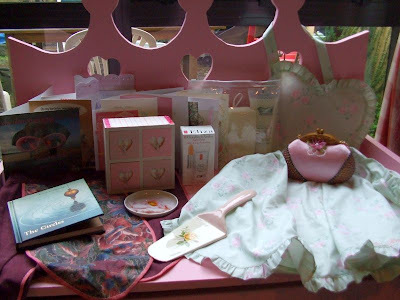 And lots of pink, girly and vintage themed goodies as well as money and things for the soul! Very nice! 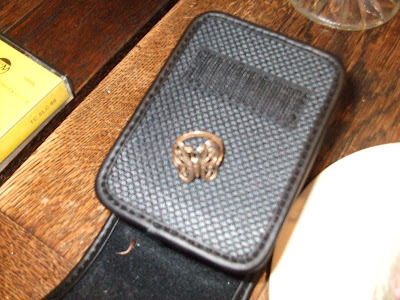 My brother, sister in law and three nephews gave me this divine butterfly filigree ring. Sorry its the best photo I could get. 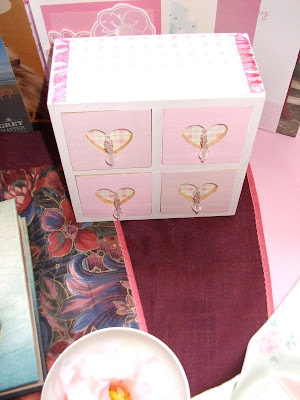 Dear Gail gave me, among other bitties, this trinket box with four opening drawers that she 'tarted' up for me. 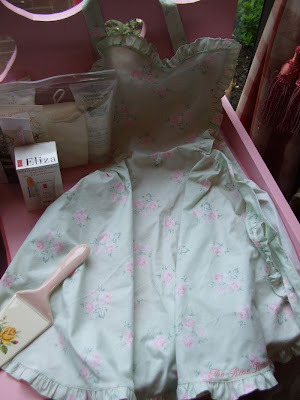 My bestist friend Sonje made me this gorgeous 50's style apron and had The Rose Room embroidered on the hem line! Another good friend Kirsty gave me this Pin Money purse. It was really weird because I had seen them on Stephanie's blog, the week of Karla's Romantic Home party and I had coveted them but hadn't told anyone apart from a comment on Stephanie's posting about them. And then my lovely friend Melanie who helps me in the shop came to work yesterday with these! 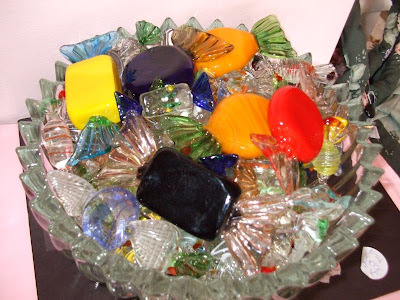 Are they not gorgeous, art glass sweeties, a whole bowl of them! Actually I had seen them at her house and told her she could give them to me for my birthday and she did! 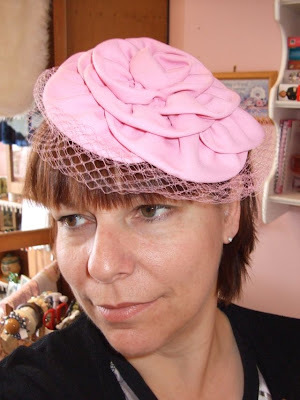 She also gave me this gorgeous PINK hat! 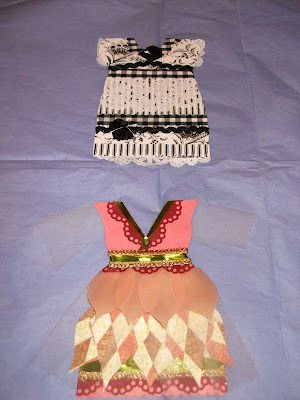 Yesterday my Paper Doll Dresses arrived from America from my swap partner Michelle. Too gorgeous. 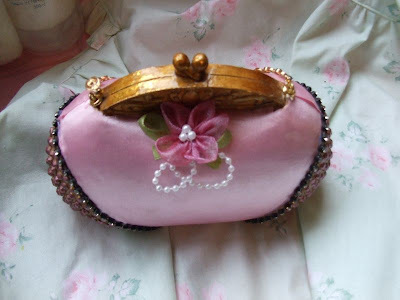 This swap was hosted by the talented Heather over at Jewelled Elegance. The 'Designers Choice' dress was inspired by the black and white swap Michelle had recently participated in and the 'Fall Dress' was inspired by the colours she loves seeing in the beautiful North West Oregon fall. Thanks so much Michelle, I love them. And thanks to Heather for hosting the swap. And finally, I've been tagged by Natasha's friends, Jenn and Jacqui. Go check them out, they have recently posted photo's of their utterly and totally gorgeous house, which I can't believe they are moving from! Actually while you are checking things out, swing by Natasha's, she has just listed the most divine velvet beaded, lavender strawberries in her shop. They are the nicest I have seen and have put them on my wish list! Link to the person who has tagged you and post these rules. Share 7 facts about yourself, some random, some weird...all devastatingly interesting. Tag 7 people at the end of your post and list their names (linking to them) Let them know they've been tagged by leaving a comment at their blogs. I have strange food fetish's. I fixate on a food and then eat mostly that food for months on end! One year I ate a piece of broiled chicken and broad beans almost every single night of the week. Another time was salad and mushrooms for about 3 months! And lately it is plain white rice wrapped in seaweed!! Is that obsessive compulsive behaviour??? I like to give my pets and other peoples pets middle names. Don't ask me why, I just do. My friend Gail's dog is Rick, I call him Richard Simon. Among others we have had Riker John, Chance Wilfred and currently Coco Chanel. I hate camping, hate it, hate it! I am strictly a beach house or luxurious, expensive hotel, hot running water, clean private toilets etc get away kind of girl. I went camping once in the early days of my relationship with Babes. I amused our camping friends with my luxury air bed, fitted sheets and matching pillowslips and comforter. Not to mention the many cleansers I had for face and body as there were no showers. I had tried to buy a chemical toilet and solar shower for the two LONG nights we were away but Babes drew the line at that! I HATED it! I can't go to sleep without reading. Doesn't matter if I am dog tired, drunk whatever I still have to pick up a book and at least attempt to read a page. Babes will quite often come to bed and find me asleep with book still in hand! I see things, like ghosts. It's true I do. Babes and I used to live in a 1918 railway workers house and a lady wearing a blue dress used to wander up and down our driveway. Recently I have been seeing a black cat that pops out at me from around corners and a lady wearing a long black dress. They don't scare me but I don't want to delve any further into it either. SPOOKY! I am quite superstitious. I have all these rituals and little blessings I do each morning when I open the shop. I don't walk under ladders or open umbrella's inside etc etc. Some of my little rituals are Chinese based. I am more Chinese than some of my Chinese girlfriends! My life has a lot of strange coincidences. Here's the strangest. Babes and I adopted Stella. Stella is the name her birth mother gave her. My Mum and Granny's middle name so happens to be Stella. Stella's birth mum shares the same maiden name as my Mum. Her birth Mum also lived in a street that had the same name as my Granddad's street in another city. Stella was born on my Stepfathers birthday, now how does all of that happen to people who were random strangers until the baby was four days old. Strange . . . So there you are, 7 weird, scintillating and fascinating things about me! You are supposed to tag 7 other people but I can only think of, Mum, Karen, Catiean, Barb, Diane. who might not have been tagged. Thanks for visiting, sorry for going on and on and on, actually that's the 8th thing about me, I do go on and on and on and on . . . !